Danish dairy farmers are refusing to let animal rights campaigners film on their farms - despite being offered £6,000 to let the cameras in. 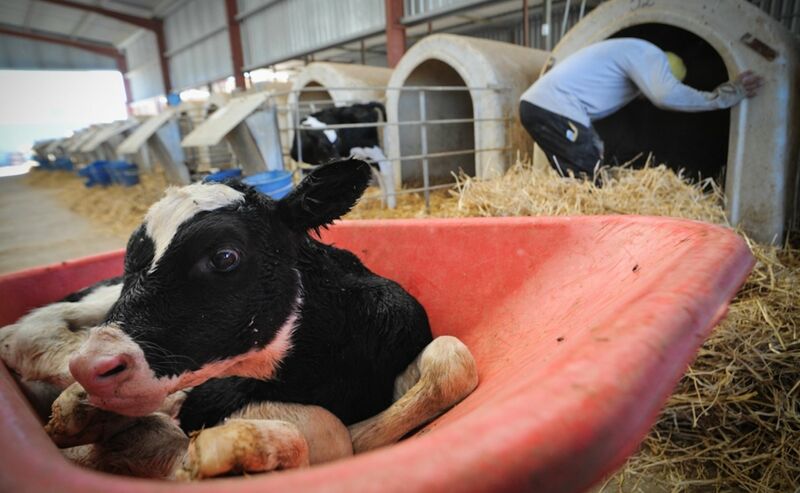 Campaigners from vegan organization Anima claim the footage would reveal distressing 'standard practices' on dairy farms - including the separation of young calves from their mothers, and the shooting of bobby calves. Danish farms supply a number of British brands including Arla. The proposed filming is part of a campaign by the group to stop farms which supply Arla from removing calves from their mothers. The group says the majority of people do not understand how the dairy process works. "We asked Arla to show us what the process of separation calf from mother was like and let us film, including when many of the calves are shot at birth. They refused, saying they couldn’t show us because they're not the farmers," Kirsty Henderson, of Anima, told The Independent. According to the group's campaign: "Now we are asking farmers directly. [We have printed] new ads in the newspapers, where we promise a [£,6000] fee to the farmer who will show all the things that Arla has not done. "We have also sent messages directly to the six dairy farmers who are in Arla's board of directors. Anima is looking forward to being invited inside the stable." Henderson told The Independent that about 10 farmers had expressed interest in filming, but none had agreed - she believes Arla has told farmers to refuse. "Arla is a farmer-owned co-operative, and our farmers make and share their own videos explaining on-farm practice to Arla customers," said a statement by Arla. "Educating the public on how dairy farming works is a high priority for our farmer owners. "Many open their farms to the public on Open Farm Sunday, and we arrange school visits to both farms and our production sites across the year to enable the public to see for themselves how milk is made." Anima's concerns around public awareness and lack of transparency from farmers follows similar worries in the UK. At the beginning of the year, vegan activist Earthling Ed was featured on the BBC's Victoria Derbyshire program, where he challenged a farmer about keeping the dark sides of his industry hidden. "Do you show people who come to your farm the artificial insemination, do you show them what happens to the calves - the pens they are kept in for up to eight weeks at a time where they are not allowed to see their mums...do you take them to slaughterhouse as well and show them the knives being pulled across their throat?" Ed asked. Farmer Paul Tomkins replied: "I like to think we show everyone the full spectrum of farming."